IPCC curve of temperature increase vs. time. Burning fossil fuels has been proposed as a cause of global warming. Propose possible mechanisms (more than one) whereby burning fossil fuels could lead to global warming? 1 minute think by yourself and then talk to members of your group. After group work, have groups present mechanisms and put on the board. What could you do between now and the next class to help explore this model. Please discuss how to explore the model on the blog/folder/wiki, each group mem (Find the numbers that you need) and then in the next class period quantitatively evaluate the model. Do you need an exact model or could you estimate? How do you sort out different claims to knowledge? How does the popular press disseminate findings? Tylenol helps dispel existential angst? Different knowledge claims based on the audience. In the short term. Relationship between popular media and science. Fox news vs. NYTimes. Short term vs. long term. Pick a claim that is not too incendiary. Frame with RuPaul’s drag race. Drag queen comes out as transgender, man to woman. RuPaul had to decide whether or not she needed to be disqualified. Donnie: Different constructs of knowledge: open up the question, not necessarily conclude. Problematizing question that seem to have very certain answers. Of course this is the answer! But wait. Keep the conversation on a particular ground…so the theme stretches across the cases. Subject: categories that are scientific/cultural. Different forms of knowledge assertion. Goal: students will understand the difference between the cultural, legal, and scientific framing of an issue. What is gender testing? Gender testing as an inappropriate (?) exercise of scientific knowledge. Is it genitalia, is it chromosomes, is it androgen receptors? IAAF: excessive androgen levels…serum testosterone in females must be below the male threshold. Or, you have to show that you have insensitivity. Or, you have to be treated in order to compete. Hijacking of scientific status, its importation into other rhetorical realms. How do we assess? They have discussed and explored culturally and scientifically defined categories…are there other of these categories that cross these boundaries? Mara/Steve: language. Color is all in your head. World languages have different color inventories. The word gives you the category. Assessment: did the activity meet our goals? Q: where do groups get the legal information? Provide with legal wording. Three case studies. So…multiple groups doing same case? How report out? Two minutes each? Keep to three groups, so have only three report outs. One page handout. Ludmilla: whiteboards—to get overview. Biological/ legal/sociocultural issues on the whiteboard. Zane: What happens if someone in the group IS one of these groups. What happens if you have a student who identifies with that situation. One of the learning goals would be respectful discourse. You want be part of this community so you are part of this community. Need to deal with inpappropriate comments. Ground rules. Not what we think of it, but the discussing ideas. Do’n t want to be mouthpiece. These groups aren’t Other. They are among us. iClicker question to find out, do you know a transgender person? Do you know a gay person? Congenital adrenal hyperplasia, cosmetic surgery. I clicker question. Do you know anyone who is transgender, or gay, or prefer not to answer. How does scientific knowledge impact out view of the world, can impact how we see the world. Modeling this kind of conversation. Talk about the ideas, not the person. How to assess respectful dialogue? Someone could take notes. One of us could suggest wording, phrasing. I heard such and such an idea and I wanted to comment on that. Transcripts to see if there is progress in respectful speech. Caster Semenya “gender test”—what was it? Critique: movie at the end? At the beginning? Use it to frame the conversation? We're thinking about science and information literacy and scientific communication. Who is the audience for scientific communication? What are the norms of scientific discourse? (as per Lemke) What role does framing take? Moving back, the discussion moved to what is science? Is there a scientific method? Are scientists Kuhnian or Feyerabendian? What do they want to be? Is science fundamentally the same or different from other human endeavors? Do we want students to see science as it actually is? #OverlyHonestMethods How far down the rabbit hole do we want them to go? Seeing scientific papers not as stand-alone artefacts, but part of a conversation within a particular research tradition. How about eliciting alternate conceptions of science… How does science work and does it actually work that way? How does the popular press interpret science? To what extent does the popular press (and advertisers) use scientistic imagery and language to influence audiences? Maybe we can use investigative case-based learning… But we need to make things more concrete. When we talk about what is science and what is not science, what is not science? How do we recognize scientistic language and presentations that masquerade as science? We've got lots of good material. How do we structure conversation to get to the meta question of categorization? Are we going to ask them to do some work on what gender means in all these different contexts? Start off with common thing, send them off to research, bring them back. Groups will define different aspects of gender. The topic ends up being different forms of knowledge assertion. Part of the earlier conversation was science being hijacked to drive cultural decisions: recognizing and rejecting scientistic conclusions. For assessment, have students come up with, identify, or analyze another domain where science categories neither align nor correspond neatly with social/cultural categories. Or where they masquerade as each other. Our group created an group/team activity that is a hybrid between a concept map and a strip sequence that uses the conceptual framework of information flow. Our goal is for each group/team to organize an array of concepts (see below) into a model that fits into one of three possible hierarchical levels (intra-cellular, inter-cellular, and inter-individual). We anticipate that this Teaching Tidbit (TT) could be used at multiple levels and at the beginning and/or the end of a class. For example, this TT could be used at the beginning of an introductory biology course to establish the model for the semester; the model being that the course will focus on the general underlying principles of biology and use specific examples to demonstrate the basic conceptual frameworks. It could also be used in an advanced-level course to assess how well the students understand and can apply fundamental concepts to new data sets. We believe that students are capable learners, but because we, as instructors, tend to emphasize facts, many students have little understanding of common underlying principles. Therefore, we chose information flow as the model that will facilitate student understanding of basic principles in very different, yet interdependent, biological systems. Signals are integrated leading to a response. The word cloud below provides hints for the construction of a concept strip sequence using the above concepts within one of the three levels described above. Colors were chosen so as not to discriminate against those who are red-green colorblind. Click on the image to enlarge. Organize general biological concepts into a framework and provide concrete examples. 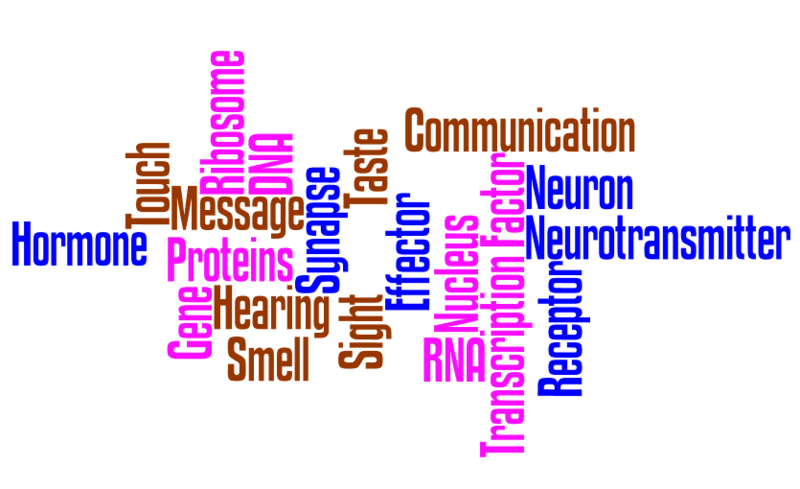 Articulate how biological pathways integrate signals, receptors, and responses. Identify similar principles of information flow on different levels of biological organization. Provide a randomized list of concepts to each group. (1) How did this activity help you organize the information you already have? (2) What else do you want to know to deepen your understanding of information flow at the intra-cellular, inter-cellular, and inter-individual levels? The Life and Medical Science group is Buzz Hoagland, Karen Riska, Ludmilla Tyler, Andy Berg, Stephanie Moechel-Cole, and Diane Genereux.